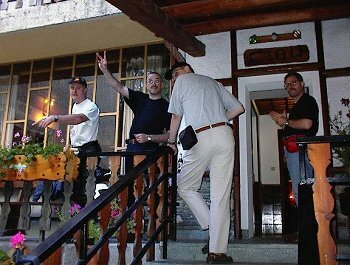 On July 25, 2000, I sailed aboard the Minoan Lines' ferry "Daedalus", destination Venice, Italy, in order to meet some internet friends, all of them riding BMW motorcycles, and have an enjoyable and -hopefully- unforgettable few days' worth riding the Italian and French Alpes, finally reaching down to Cote d'Azur. Here are the lovely and beautiful pics of Andrea. The ride in the boat, even though it lasted 40 hrs, it was really pleasant, considering also that the boat was actually half empty! So, I spent two wonderful days in the A-class luxury cabin and salons of the big ferry! First ride, in Italy, would be for me alone, from Venice to Trento, where I spent a night at the home of Sandro, a good friend, who offered me his home hospitality. On the way to Trento, still some 30 or so km's left to ride. Instead of taking the "easy" all-autostrada way from Venice to Vicenza, then turn north to Trento, I took the "short" route of going up the Passo dell Sommo, towards Rovereto and then Trento. 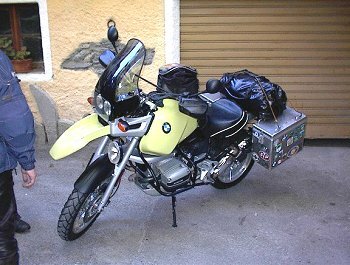 In Trento, I would meet yet another friend of the group, Duner, from the USA, with his GS1100. 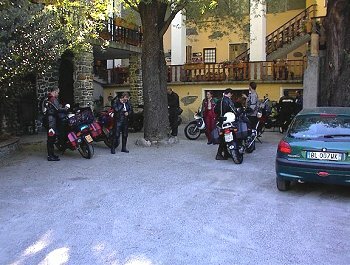 The next morning, we all three, Zozzo on his red RS1100, Duner and me rode down along the scenic road, by the lake Di Garda, then joined the autostrada at Brescia, west towards Milano, and in the evening we arrive at picturesque Novalesa, just north of Susa. The "reception committee" of Carlo2, Caratz, Danny and the others, who were already there, was really warm, for me the newbie! The following dinner proved really friendly and good tasting too! Don't forget that we had LOTS of Grappa too! Duner's GS1100, complete with extra driving lights, an awful (his words!) Givi screen, and the Touratech aluminium panniers. If you want to have a full idea of the travels, you can see the MAPS, here!. Be careful, there are 9 quite big pics in this page. and... if you wondered if we had a good time... click here: !!!!!! BTW this is how I prepared myself for the trip!